The Bloody Sunday March in Derry on 27th January is a focus for the 32 County Sovereignty Movement and the IRPWA this year to highlight the POW's campaign against strip searches and for freedom of movement, also against the use of Internment by remand. Both organisations are mobilising together to highlight this injustice. 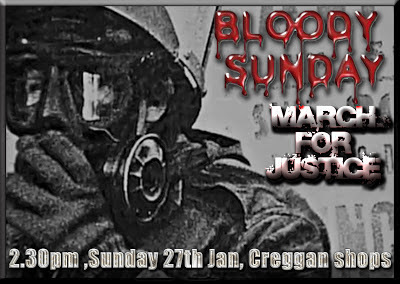 To ensure a large turnout we are asking you to mobilise in your area and to get the word out. The past years we have had an excellent turnout and this year is no exception we need to keep that momentum going on behalf of the POW's and their families.